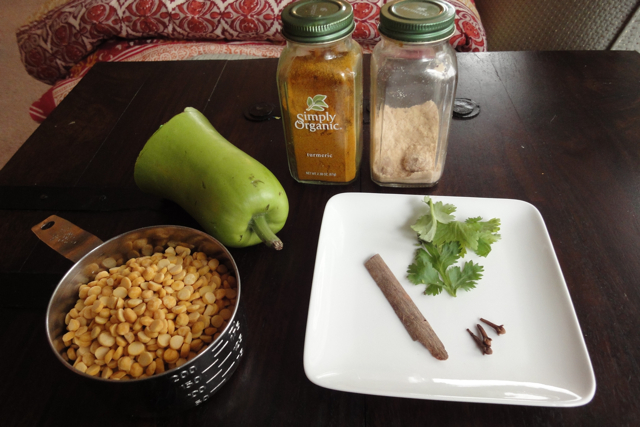 This warmly spiced lauki chana dal recipe is a childhood favorite. 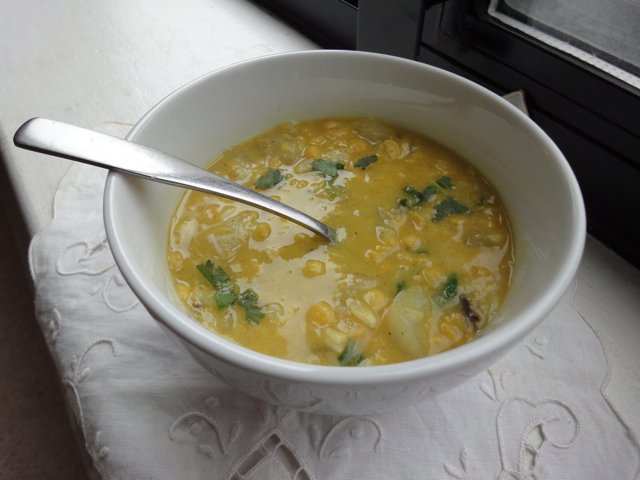 I grew up in Calcutta, and this nutty, hearty yellow lentil soup studded with pieces of translucent green bottle gourd showed up frequently at mealtimes. It’s a complete and nourishing meal when served with rice or Indian style bread. This dal can be made with carrots and spinach instead of the bottle gourd. If you plan to use spinach, you could saute some onions, garlic and ginger in the ghee after the initial tarka, before adding the dal. 1. Before beginning, wash and then soak the lentils in water for an hour. Discard the water, and place the lentils and the chopped bottle gourd pieces in a pressure cooker. Add enough water to cover the lentils, such that the water level reaches about 1/4 inch above the lentils. At medium heat, wait for 3 whistles on the cooker, which is about 15 minutes of cooking time. Turn off the heat and put the cooker aside. Wait for the steam to release entirely before removing the lid. At this point the lentil and the bottle gourd should be soft and mash easily between your fingertips. 2. Heat the ghee in a separate heavy bottomed pot. When the ghee is hot, add the asafoetida and cumin seeds, along with the cinnamon stick and cloves. The cumin seeds should sputter a little. Immediately add the boiled lentil and bottle gourd mixture and stir. Add turmeric and salt and some water if too dry, and bring to boil on medium heat. Cook for a few minutes, before removing from the heat. You can add a pinch of garam masala if available, a squeeze of lemon and chopped coriander to serve.